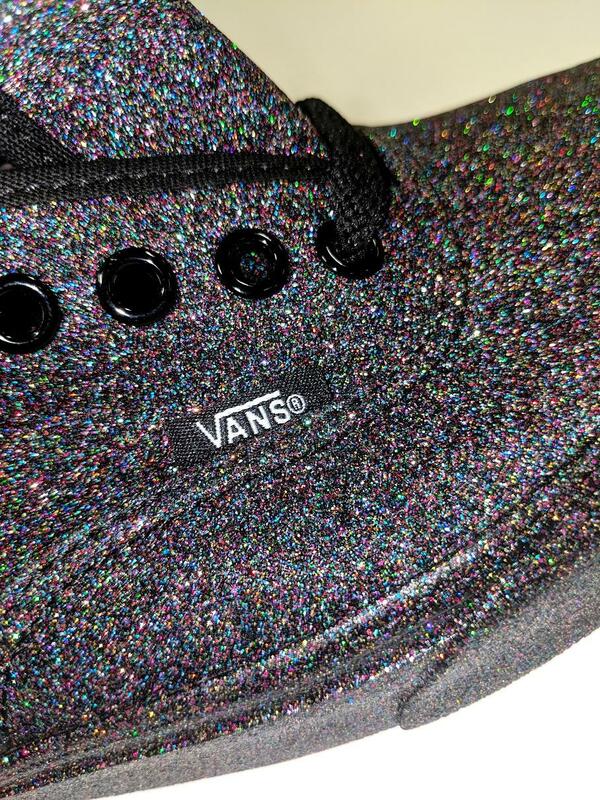 I nabbed these bad boys in the January sales on the Vans website but just look at their glittery majesty! I can live my very best glitter goth life in them. Photographing them was a bit tricky so I’ve dropped them out of focus in this next shot so you can see the glitter particles. The rainbow flecks are on a black base which helps them pop and sparkle. Vans Glitter Authentic Trainers, a long with a huge selection of their trainers are 100% vegan if that’s your thing. The Uppers are made from a glitter coated canvas fabric which has zero glitter fall out and the glitter is moulded in to the rubber side walls, you’ll not end up with sparse shoes. I like a black trainer as I think they go with most things and as I am fortunate enough to be able to wear trainers for work – I do. 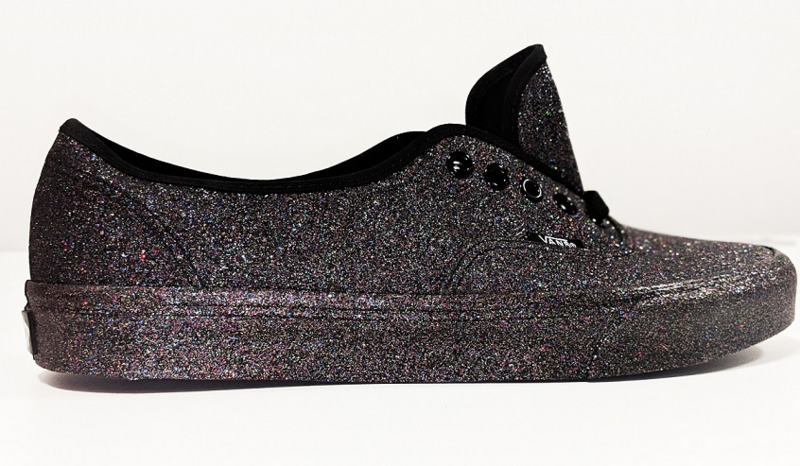 These Vans Glitter Authentic trainers are elevated in their awesomeness by the glitter. Bold enough to brighten up a dull jeans day but subdued enough to be just a plain black pair of sneaks on first glance. Of course as far as dancing shoes go, down your local rock night, you can’t get better than these! I didn’t think anything would ever compare to my tacky-tastic cat face Vans but these are a close joint first place. Who has time for plain trainers eh?! You can see my other cat Vans in their own post HERE , my punk rock leopard beauties HERE or even my summery Flamingo Vans HERE. 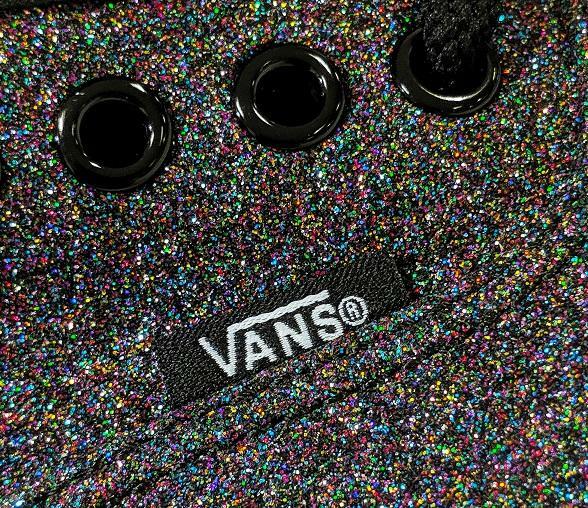 If these goth-tastic Vans Glitter Authentic trainers aren’t your style, check out the other glittery goodies HERE on their site.